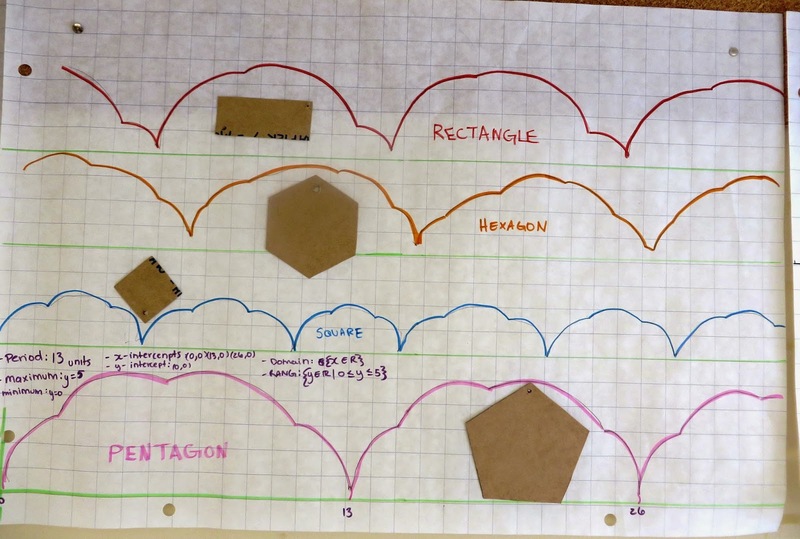 In this activity you are going to investigate the rolling of a geometric shape. You will cut out a shape and poke a hole in the shape. With your pencil in the hole, “roll” the shape along a straight edge at the bottom of your chart paper. Cut a square, a rectangle, a regular pentagon or a regular hexagon out of the thick paper. Make sure your shape has dimensions between 2 cm and 10 cm. There are templates for you to use if you are having trouble making your own shape. Using your pencil, poke a hole in your shape. Turn your chart paper so the longest side is horizontal. Using the metre stick and a marker, draw a straight line horizontally half of the way down the chart paper. Leave the metre stick on this line on the paper. Place your pencil in the hole and roll your shape across the straight edge of the metre stick. Label this graph with the name of the shape. Using the same piece of chart paper and the metre stick, draw another line horizontally 5 cm from the bottom of the chart paper. Cut a different shape out of the thick paper. Make sure your shape has dimensions between 2 cm and 10 cm. Poke a hole in the shape and roll your shape across the second straight edge. Label this graph. Darken each graph with a different coloured marker. 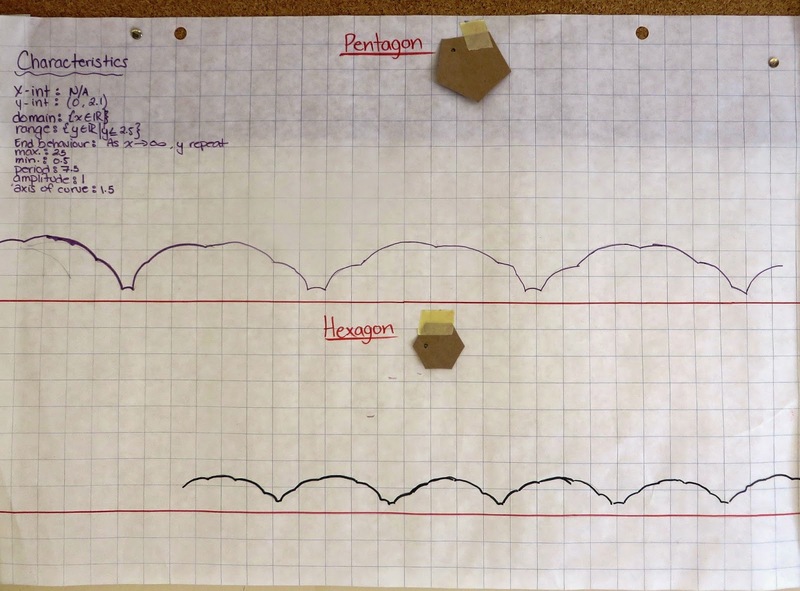 Tape your shape to your chart paper. Answer and discuss the questions following. a) How would the graph be different if your hole was in the same position on a smaller similar shape? b) What similarities exist between the 2 graphs? c) What differences exist between the 2 graphs? d) What would a graph generated by an octagon look like? e) What would a graph generated by a circle look like? What type of function is this? f) If you wanted to make a graph with larger ‘waves’, what changes would you need to make to your shape?